Hillary Clinton campaigned Tuesday in Coconut Creek, Fla.
WASHINGTON — The latest buzzword in the presidential election is “landslide.” The media — from the Arab News to The Washington Post — have seized on it, and a group of eager Clinton supporters even has a website: Will Hillary Clinton Win By A Landslide? But whatever happens on Election Day, political scientists say, it almost certainly won’t be a landslide, at least not by historical standards of the blowouts that elected Ronald Reagan in 1980 and reelected him four years later, reelected Richard Nixon in 1972, and elected Lyndon B. Johnson in 1964. It could be a large wave perhaps, or even a small tsunami. Maybe, they point out, we need an altogether new geological or meteorological metaphor for a win that is big by modern standards, but falls well short of those past political earthquakes. That could complicate the Clinton campaign’s likely efforts to portray a victory, should she win, in the grandest terms possible. 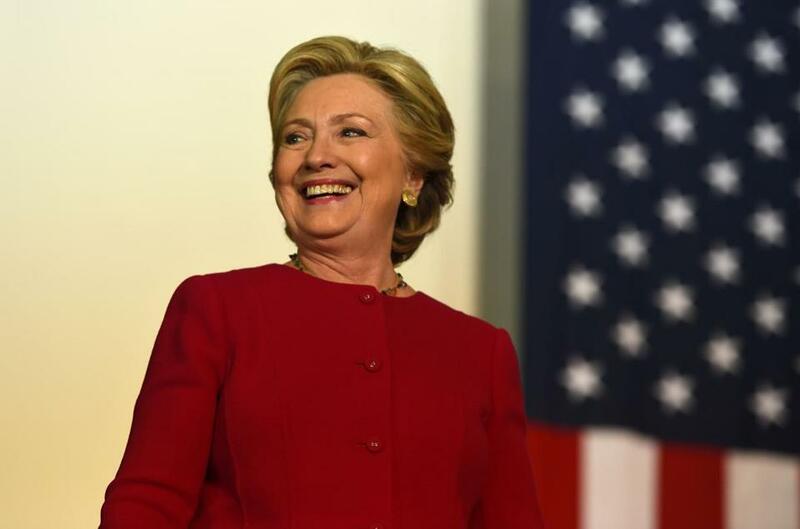 In Clinton’s case, she would seem to hope that America’s voters not only repudiate Donald Trump, but validate her, her thousands of pages of policy proposals, and her dynastic candidacy. But in this era of polarized Americans, polarized politics, and polarized geography, it’s just not that simple. Landslides occurred in the presidential elections in 1964, 1972, and 1980. Read: Is Donald Trump choking now? The language that is used to characterize the outcome helps shape the public perception of the victory — and how the winner can govern. Johnson in 1964 defeated Barry Goldwater with 486 of the 538 electoral votes and took 61.1 percent of the popular vote, with the largest margin in history. He used that victory, and the massive congressional majorities it brought, to usher in sweeping legislation for Medicaid, Medicare, and civil rights. In 1972, Nixon won all but Massachusetts and the District of Columbia. Democratic nominee George McGovern even lost his own state, South Dakota. Reagan in 1980 defeated President Carter and helped Republicans retake the Senate for the first time since 1952. With his mandate, he pushed through tax cuts and reductions in government programs. In 1984, he carried 49 states in defeating Walter Mondale. Even under the best-case scenarios for Clinton – in which she carries every state now up for grabs — she is unlikely to win more than 380 electoral votes. The most states she could win would be 32, and that includes Texas, Utah, and Georgia, all sizable long-shots. “It’s ain’t Reagan against Mondale or Bush against Dukakis, but it’s a handsome win, a respectable win. I think that’s where we will end up with,” said Frank Lavin, a former political director for Reagan who has endorsed Clinton. Determining whether an election is a “landslide” is an art more than a science. It’s a term that journalists and pundits have used, but not one with an accepted political science definition. Up until 1888, the word “landslide” was mostly used for natural disasters, but then The New York Times used it to refer to a congressional race in Michigan. In the early 20th century, it started being used more and more on presidential elections — although “avalanche” was also commonly used. “Coolidge wins in landslide,” declared the Detroit News in 1924. “Roosevelt Elected in Democratic Landslide” blared the Baltimore News in 1932. And, four years later, the Washington Post weighed in with: “President Roosevelt Is Reelected in Landslide.” “Nixon Elected in Landslide,” read the 1972 banner headline in The New York Times. “Reagan Wins by Landslide,” read the New York Daily News in 1980. “No one has really defined it. There’s no definition of what constitutes a landslide. It’s kind of like you know one when you see one,” said Alan Abramowitz, a political science professor at Emory University. A wave, on the other hand, is often defined as an election where down-ballot candidates also win. That may be more likely in 2016 — with Democrats poised to win a series of Senate races and cut into the Republican House majority — but even that might be a stretch by historical standards. He sought to reform Social Security and immigration, but was unsuccessful on both. Modern Washington’s inability to work across the aisle makes deal-making and compromise seem like a lost art. After Obama’s 7-point victory in 2008, Republicans dug in. Nonetheless, he was able to convince Democrats that he had a mandate to pass a massive health insurance coverage expansion. After Republicans won control of the House in 2010, and the Senate in 2014, Democrats dug in, too, trying to preserve the health care law. Fewer moderates in both parties make a governing coalition — and any ability to enact a mandate claimed, fairly or not — almost impossible. Annie Linskey of the Globe Staff contributed to this report. Matt Viser can be reached at matt.viser@globe.com. Follow him on Twitter @mviser.